Dexcom vibrated on the nightstand and I ignored it. I heard it, but I ignored it. It vibrated again, but this time was accompanied by the ear-splitting “beep” alarm. Instinctively I threw out my arm and dragged the glowing receiver in front of my face. It said I was high, reading me at 184 and the time registered as 4:15 am. I rolled over onto my back, holding the receiver on my chest and allowed my eyes to droop closed again and the screen’s glow lit up the entire bedroom. “Are you going to handle that,” mumbled Brad, causing me to open my eyes again. I didn’t want to get it, I just wanted to go back to sleep. I reluctantly pricked my finger and tested while my husband stumbled to the bathroom. “What was it?” Brad asked when he climbed back into bed. “It was 141, I didn’t need to be awake,” I complained and went back to sleep. I can’t say that we enjoy our time with you and 2 a.m. last night. We would rather sleep with you instead. I leave my Dexcom on vibrate, face up on the night stand while we sleep so that it wakes me but not Brad. In the past, I always heard the vibrating and woke up to the light. “I know,” he responded then pulled the covers up over his head and promptly went back to sleep. I reluctantly set an alarm for 4 a.m. and laid back down. At 4 a.m. I hit snooze on my alarm and laid there in a haze trying to figure out why I was awake. At 4:15 it dawned on me, I need to test. I tested and came up with a result of 197. I let my PDM calculate a bolus and checked to see how much insulin was still active and I took the whole recommended bolus. I drifted off to sleep around 4:45 and reluctantly crawled out of bed at 6:30 this morning. When I say that I had a “rough night,” I usually mean something very different than many of my peers (that includes both the “partied too hard and have a hangover” crowd and the “baby didn’t sleep so parents didn’t sleep” crowd). I’ve been up a lot at night with my diabetes. Last night it was multiple low alarms on my Dexcom and depleting my bedside glucose tablet supply. Other nights, it’s been slowly battling my numbers with insulin in the fall out of a bad infusion site. Setting an alarm for every two hours to test and take more insulin is less than fun, but the last thing I wanted to do was let the numbers do whatever they wanted and end of sick. Then some nights, it’s because I wear a medical device and it woke me up when I rolled onto it. Sleeping with an OmniPod under your back is much like laying on a rock. When I was a teenager, I used to have serious sleeping problems. I was awake for 48 hours straight at one point in my senior year because I couldn’t turn off my brain and sleep. College was not conducive to positive sleeping habits, so when I’d graduated and settled into married life, I started sleeping better. Now diabetes is getting in the way of a good night’s sleep. 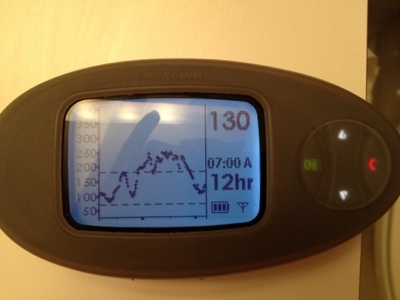 When I don’t sleep well, my body gets stressed and my diabetes responds… and my Dexcom buzzes more. It’s a vicious cycle. 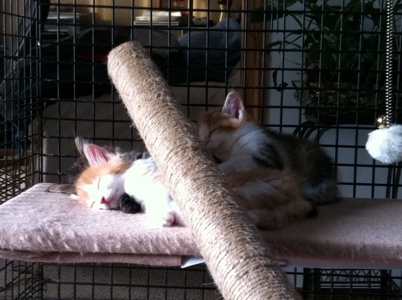 I would dream of sleeping soundly if I could. Oh to be able to sleep that easily!